Our summer CSA comes with a chef! One of the things people love about our CSA is eating in tune with the seasons. We meticulously research varietals that thrive in our climate, and plant and harvest them when they want to be planted and harvested. We work for nature, not the other way around! That gives each pickup a wonderful sense of discovery, but that’s only half the fun: then you get to eat what you bring home! That’s why every 47th Avenue Farm share comes with members-only access to Cook With What You Have, an amazing online resource curated by local chef and food activist Katherine Deumling that’s packed with great recipes – and even better, specifically tuned to what’s in your CSA pickup each week. Give it a try yourself, for free. Katherine’s unlocked two easy recipes featuring cauliflower and green garlic, two (of many) veggies our shareholders can look forward to among the first pickups. Shareholders tell me they’ve gone for stretches where they just choose a veggie from our share, pull up her site, and just randomly pick any recipe she’s got for it. They’ve never been disappointed. It’s like having a personal CSA chef consultant! I’d like to share it with you. 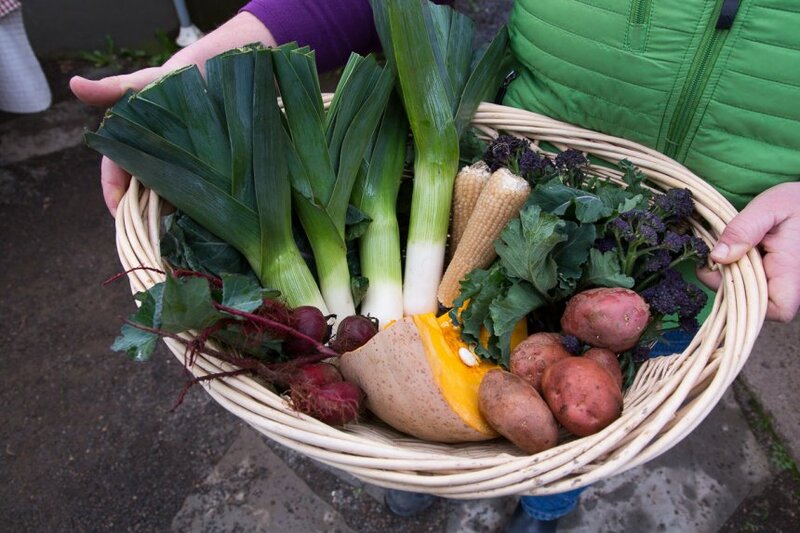 Our pioneering Summer Veggie CSA – with two pickups in SE Portland and Lake Oswego’s Luscher Farm – starts today, on May 15th. Join us! Comments Off on Our summer CSA comes with a chef! This beautiful spring means a bountiful summer! What a glorious spring it’s been! Just the right amount of sun, a perfect range of temperatures, and the kind of pristine air only rain showers can bring. We’ve been mowing down lush flowering fields of winter cover crop and planting spring & summer veggies. Whether I’m driving the draft horses or the electric tractor it is remarkable time of year to be out in the fields. Churning up the scent of fresh, pure soil, I’m overwhelmed with the sense that anything is possible. Boy, I think to myself, this is why I’m a farmer. And of course, it doesn’t hurt that a beautiful spring like this also makes incredible summer vegetables – something that also swells my farmer’s soul as I walk the fields. Even after more than two decades of farming, I’m still amazed what a miracle it is that these baby seeds & plants will soon become the incredible bounty of the summer. Will you join me for it? Our pioneering Summer Veggie CSA – with convenient pickups in SE Portland and at Lake Oswego’s Luscher Farm – starts next week! Pickups are once a week for 24 weeks, and despite all the care and hand work we shower on our vegetables, the cost is as little as $3.50 a day (or $6.30 a day for a more ample, family-size pickup). In fact, on average, you’d pay 10-20% more for the same veggies at your local natural food store or farmers market. I’m really proud of the value we continue to offer our shareholders. 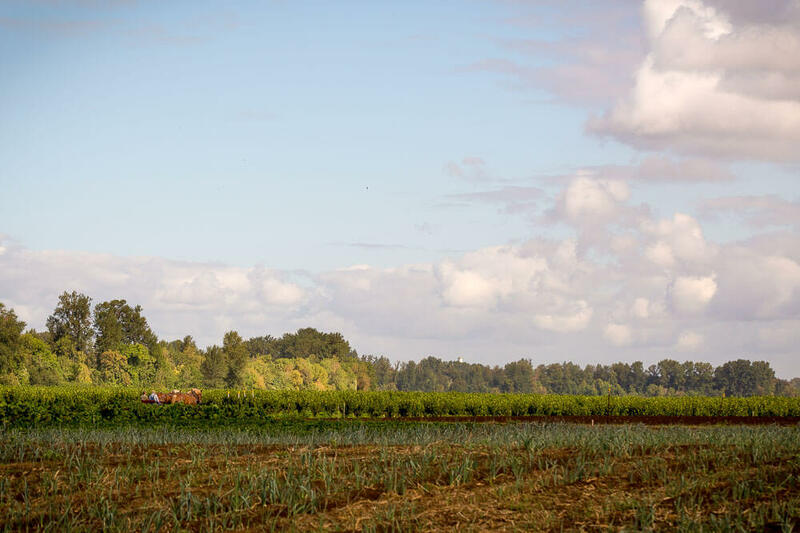 Getting started is easy: simply sign up before your first pickup – SE Portland, or Lake Oswego’s Luscher Farm. Then, 24 glorious weeks of delicious, local, sustainably farmed produce are yours! Comments Off on This beautiful spring means a bountiful summer! We’ve been dreaming about sweet winter carrots, purple sprouting broccoli, heirloom winter squash, and a whole lot more, so we couldn’t be more excited our tasty winter/spring share is starting this week! … and 24 weeks (across 12 pickups) of delicious winter and spring produce will be yours! And by the way, if you live in the Lake Oswego area and would prefer to pick up at the historic Luscher Farm, that’s easy, too: learn more here or just sign up here and join us for pickup on Thursday. Comments Off on Winter share starts tomorrow! Inspiring Cooking Class this Saturday!! This is a rare opportunity to learn from one of Portland’s best cooking teachers and Slow Food national board chair Katherine Deumling. 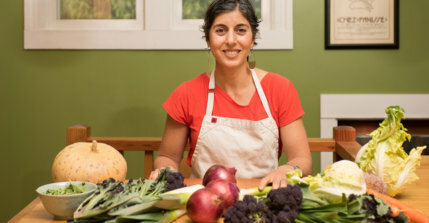 She is only teaching one public cooking class this fall and it is this coming Saturday Nov 10th from 2-4pm at Luscher Farm in Lake Oswego. The focus of the class is cooking with all the beautiful local winter veggies that we grow here. Learn how to make a variety of dishes illustrating simple and inspiring ways to enjoy the winter season produce. The class offers opportunities for participation, interaction and lots of tasting, so bring your questions about winter produce and come cook with us!! Get more info and sign up for the class HERE. Comments Off on Inspiring Cooking Class this Saturday!! Hope you can join us for the Open House & Potluck Dinner at the Woodstock Community Center!! This Sat Nov 5th is the In Your Farm Share Cooking Class at Luscher Farm. It will be taught by Allen Doty, head chef at Riccardos Ristorante. You don’t need to be a CSA member to participate – everyone is welcome. This is a perfect opportunity to learn some new strategies for cooking locally & seasonally. You’ll go home with great recipes & techniques – especially for using all those winter veggies! !